USS Topeka (CL 67) was laid down on 21 April 1943 by the Bethlehem Steel Co. Yard located at Quincy, Mass., launched on 19 August 1944, sponsored by Mrs. Frank J. Warren and commissioned at the Boston Navy Yard on 23 December 1944, Capt. Thomas L. Wattles in command. 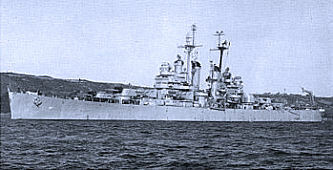 After shakedown cruse in the West Indies and post-shake-down repairs, Topeka departed Boston on 10 April 1945 for duty with the Pacific Fleet. The following day, she joined Oklahoma City (CL 91); and the two ships steamed by way of Culebra Island and Guantanamo Bay to the Panama Canal. They transited the canal on 19 April and reported for duty with the Pacific Fleet on the 20th. The next day, Topeka and her steaming mate headed for Pearl Harbor, where they arrived on 2 May. Following almost three weeks of gunnery exercises in the Hawaiian Islands, the cruiser sailed west from Pearl Harbor as the flagship of Cruiser Division (CruDiv) 18. She entered Ulithi Atoll in the Western Caroline's on 1 June and, after three days in the anchorage, put to sea with Bon Homme Richard (CV 31), Oklahoma City, Moale (DD 693), and Ringgold (DD 500) to rendezvous with Task Force (TF) 38. CL67 on Shakedown Cruise as seen from the USS Oklahoma City. On her first cruise with the fast carriers, she screened them against enemy air attack while their planes made three raids against targets in the enemyâ€™s home islands and the Ryukyus. On 8 June, Task Force 38 aircraft hit Kanoya on Kyushu â€” the home of Japanese naval aviation. The next day, they struck the Ryukyu Islands â€” specifically Okino Daito, located a little over 200 miles west of Okinawa. The third and final strike of her first combat cruise came on 10 June and provided the cruiser with her initial opportunity to join the fray. While Task Group 38.1 aircraft bombed and strafed the airfield on Minami Daito, the ships in the screen â€” Topeka among them moved in and took the other installations under fire. At the conclusion of that action, Topeka moved off with the rest of TG 38.1 bound for San Pedro Bay, Leyte. After spending the latter half of June at Leyte for relaxation and replenishment, the light cruiser returned to sea on 1 July with TF-38 for the final six-week carrier sweep of the Japanese home islands. The task force made a fueling rendezvous on the 8th and then began a run-in toward Tokyo that the American planes bombed on 10 July. Next, the ships moved north to Honshu and Hokkaido for a two-day anti shipping sweep of the area around Hokadate and Muroran. They retired from the area for another fueling rendezvous on the 16th, but returned to the vicinity of southern Honshu and resumed the aerial blitz of Tokyo on the 17th and 18th. On the night of the latter date, Topeka had another opportunity to strike the enemy directly when she joined Atlanta (CL 104), Duluth (CL 87), Oklahoma City, and the destroyers of DesRon 62 in an anti shipping sweep of the entrance to Sagami Nada near the sea approaches to Tokyo. During that sweep, she fired her guns at Japanese installations located on Nojima Zaki, the point of land that marks the eastern terminus of the entrance into Sagami Nada. Completing another replenishment retirement between 19 and 23 July, the task force resumed its air raids on central Japan with two extensive forays against shipping in the Inland Sea on the 24th and the 28th, respectively. A typhoon at the end of July forced the task force to take evasive action and postpone further air operations until the second week in August. At that time, Topeka steamed north with TF-38 while the carriers moved into position to send sortie after sortie against heavy concentrations of enemy aircraft on northern Honshu. Those raids â€” launched on 9 and 10 August â€” proved eminently successful, wiping out what was later learned to be the transportation for 2,000 shock troops being assembled for a one-way, suicide mission to destroy the B29 bases on Tinian. The carrier planes paid return visits to Tokyo on the 12th and 13th and were taking off to repeat those attacks when a message arrived on the 15th, telling of Japan's capitulation. 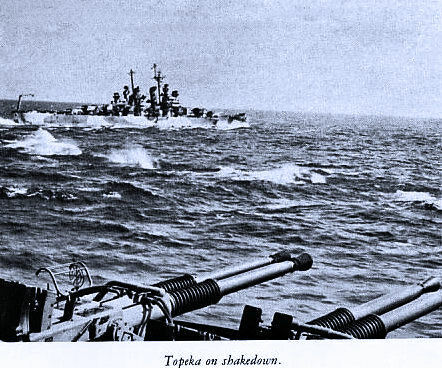 Topeka patrolled Japanese waters until mid-September, at which time she entered Tokyo Bay. She remained there until 1 October when she began her homeward voyage to the United States. The cruiser stopped briefly at Okinawa on the 4th to embark 529 veterans and resumed her eastern progress on the 5th. On 19 October, she arrived in Portland, OR, and disembarked her passengers. Ten days later, she steamed south to San Pedro, Calif., for overhaul. On 3 January 1946, the warship put to sea to return to the Far East. She reached Yokosuka, Japan, on the 24th and began duty supporting American occupation forces in Japan, China, and in the Central Pacific islands. During that tour of duty, which lasted until the following fall, she called at Sasebo, Japan; Tsingtao and Shanghai in China; Manila in the Philippines; and Guam in the Marianas. The cruiser returned to San Pedro, Calif., on 20 November. 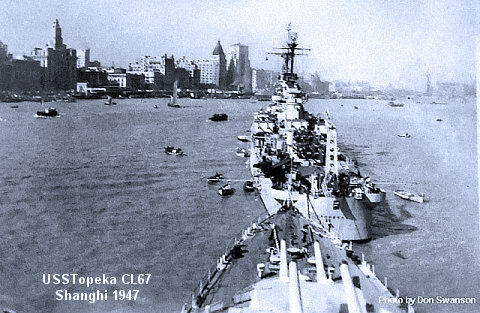 I came across your website of the USS Topeka CL 67 and realized that we were moored behind Topeka in Shanghai September and then in December 1947. I was on HMS SUSSEX--heavy cruiser. I took this picture all those years ago. 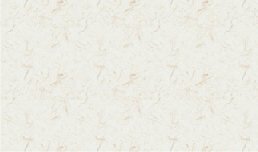 It thought it might be some interest to your members. Following an overhaul and operations along the west coast, she headed back to the Orient on 22 September 1947. Upon her arrival at Yokosuka, Japan, on 10 October, she became a unit of T 71. Operating from bases at Shanghai and Tsingtao, the warship patrolled the north China coast while civil war raged on shore between Nationalist and communist factions. She concluded that duty early in March and entered Nagasaki, Japan, on the 8th. Following visits to Sasebo and Kure, Topeka sailed for the United States on 25 April and arrived in Long Beach on 7 May. Later that month, she moved to Pearl Harbor for a four-month overhaul at the completion of which she returned to the west coast. Late in October, the warship resumed local operations out of Long Beach and out of San Diego. She remained so occupied until February 1949. On 25 February, she arrived in San Francisco to prepare for inactivation. Topeka was decommissioned there on 18 June 1949 and berthed with the local group of the Pacific Reserve Fleet.